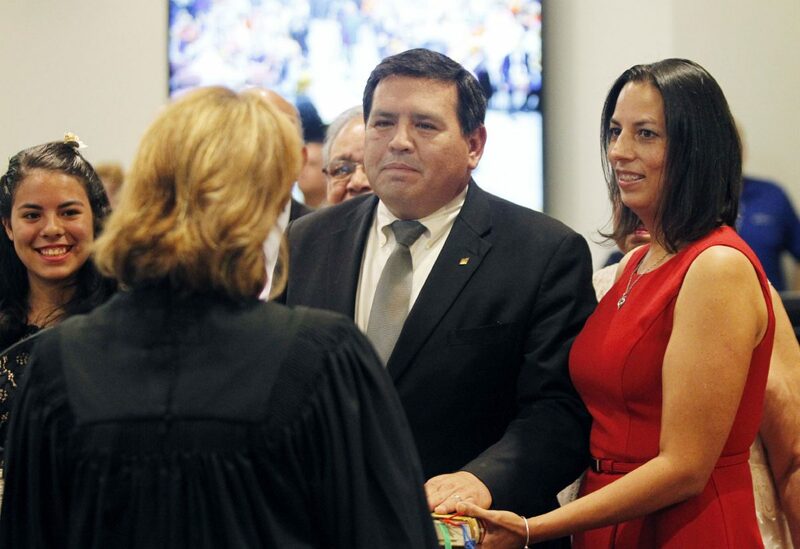 MCALLEN - Judge Rose Guerra Reyna swears in new McAllen Commissioner J.J. Zamora alongside with his wife Elizabeth at the City of McAllen Commissioners chambers Monday May 22,2017 in McAllen. 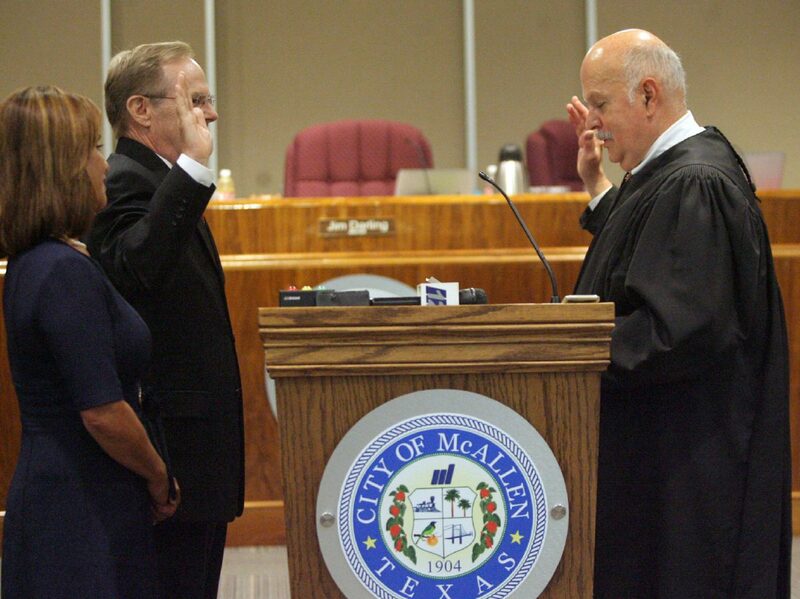 McALLEN — The typically chilly city commission chambers turned to a humid, standing-room only quarters Monday as Mayor Jim Darling and District 2 Commissioner Joaquin “J.J.” Zamora’s contested races were put behind them as the two were sworn into office. Zamora, 45, defeated former Incumbent District 2 Commissioner Trey Pebley, the first time an incumbent lost here since 1997. Zamora ran a low-cost, grassroots campaign, and said he walked 38 of the 45 neighborhoods of the district during the campaign. Zamora took roughly 65 percent of the District 2 votes compared to Pebley’s 35 percent. Darling, 68, took down Othal E. Brand Jr., son of longtime Mayor Othal Brand. Darling fended off a Brand campaign that spent more than $200,000. Darling captured nearly 60 percent of the vote to Brand’s roughly 40 percent. This is Darling’s second term as mayor, after two terms on the city commission; before that he was longtime city attorney. New District 3 Commissioner Omar Quintanilla ran uncontested for the District 3 seat, vacated by Hilda Salinas, who retired after 16 years on the commission. District 1 Commissioner Richard Cortez, 73, ran unopposed for re-election. MCALLEN - Judge Ricardo Hinojosa swears in McAllen Mayor Jim Darling alongside with his wife Sandra at the city of McAllen Commissioners chambers Monday May 22, 2017 in McAllen. MCALLEN - Newly elected McAllen Commissioner Omar Quintanilla is sworn in by Judge Ricardo Hinojosa at the City of McAllen Commissioner Court Monday May 22,2017 in McAllen. U.S. District Judge Ricardo Hinojosa swore in Darling and Quintanilla, 206th District Court Judge Rose Guerra Reyna swore in Zamora and Darling swore in Cortez. Zamora and Quintanilla are Rio Grande Valley natives. Quintanilla, 41, is from Mission, went to Mission High School and received his undergraduate degree in business administration from St. Mary’s University in San Antonio. He is a Vice President at Frost Bank in McAllen. Quintanilla also served as Chairman of the city’s Community Development Block Grant advisory board. Zamora, 45, was born and raised in McAllen, attended McAllen High School, received an undergraduate degree in business administration from University of Texas at Austin and earned a Juris Doctor at Texas Tech. He is an Hidalgo County Assistant Criminal District Attorney. His family owns Zamora’s Mexican Restaurant on North 23rd St. between Dove and Lark avenues. Pebley was on hand to pass over his District 2 seat to Zamora, who thanked Pebley for his service and his running of a clean and fair campaign. The city honored Pebley with a proclamation Monday, and Pebley got choked up thanking city staff for all their work. Brand was also on hand, and when Darling thanked all the elected officials in attendance, he included Brand. Brand is simultaneously General Manager and President of the Board of Hidalgo County Water Improvement District 3. Brand’s special assistant, Eddie Zamora, and campaign manager, Efrain Martinez Jr., were also in attendance. 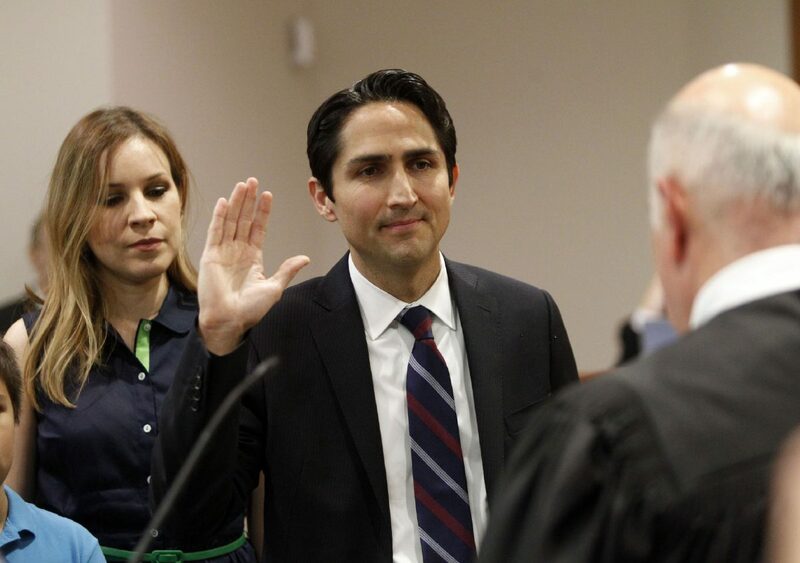 At the swearing-in ceremony, Martinez said he asked Darling if he was running for re-election in four years. The conversation did not appear to last long. As for the commission meeting, Zamora acknowledged he was eager. He jumped the gun on multiple re-zoning ordinances, and made multiple motions to table items. At one point, Zamora attempted to bring back a tabled item before Darling explained it would likely be better to bring it back next meeting. Zamora agreed. Zamora was seated between Cortez and District 5 Commissioner John Ingram, who Zamora modeled his campaign after. Ingram gave both Zamora and Quintanilla positive reviews.